it's still confusing. J One of the big problems is that the words inside and local are somewhat synonymous, as are outside and global, yet they mean different things in NAT. And the typical paradox in trying to explain networking concepts rears its ugly head here again: I wanted to define these addresses to make describing NAT operation easier, but find myself wanting to use an example of NAT operation to clarify how the addresses are used. Even after writing this section I find these terms confusing, so I created Figure 111, which shows this same terminology in graphical form and may be of some help. 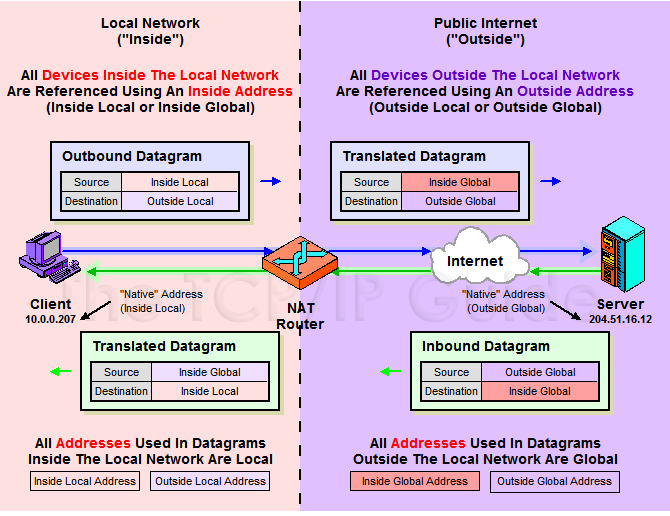 That diagram is also used as a template for the illustrations of each of the different types of NAT in subsequent topics, which use the same color coding for each of the four address types for consistency. As you read the topics that discuss NAT operation, remember to look back here if you want to double-check the meaning of address types. Don't get discouraged if it takes a couple of times to get the addresses straight.